Get the space-saving solution you need with an Andersen® contemporary sliding glass door. 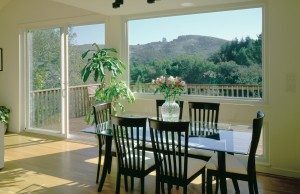 From their High-Performance™ glass to their smooth-glide movement, these sophisticated sliding patio doors have been engineered for decades of dependable performance. Contemporary styling allows for optimal glass area, so you can enjoy more of your favorite view. Choose from Andersen Perma-Shield® gliding patio doors with rigid vinyl cladding over an engineered wood core or Andersen Narroline® gliding patio doors with stainable pine interior. Find out why Andersen doors stand apart from all others. Call Renewal by Andersen of Northeast PA at (610) 355-4055 for more information on patio doors in Allentown.